← Friday Fess-Up: October 5th. Happy Sunday, Everyone! I hope you’re all enjoying the weekend! If you’ll recall, At the beginning of September I was going to make a serious push to get to the end of the first draft of my current project. I figured that it would take me another Thirty-Thousand words to get there. Ok, I can hear you all laughing from here, cut it out. It shouldn’t come as a surprise to anyone who knows me (or who even casually reads this blog) that Math and I are suspicious of each other on the very best of days. I wasn’t too far off, numbers wise. I’m currently at Ninety-Seven Thousand words and some change. I’m still a little ways from the actual finish of the Current Project. I expect it’ll take another Twenty Thousand words or so. I should be done just in time for NaNoWriMo – which I will not be participating in…or should I? As promised, I am going to break down the Month of September and take a look at the number of words I got down during that push (Which, of course, means more Math *grumble*). Ready? From the First Week, my word count was: 8447 Words. The Second Week in September saw me get down: 10,330 Words. The Third Week in September netted me: 7783 Words. The Fourth Week in September got me: 9019 Words. Now the way September was structured, there were two additional days after the final Friday Fess up for September. The combined Word Count total for the final Saturday and Sunday in September was: 2082 Words. Now that is nothing to sneeze at. Now I’m not going to sit here and try and con you into thinking that it was easy. It wasn’t. Especially when I was getting toward the end of the month and things like the day job intruded into my life more than I would prefer. Another part of this was that I was hoping that it would become a habit, and I’m happy to say that I’m well on the way to making that happen. I’ve found that I can be more flexible than I thought possible for me. I’ve written long hand, I wrote in Scrivener (which is my preferred writing program), and I’ve written in Word. To date, I have also written “Something” every day since September first. No, these posts don’t count. I’ll still be posting daily word counts on my Friday Fess-Up section of the blog. I don’t plan on posting totals for the week, because that’s not what it’s about (and I’d rather not do Math *shudder*). But, because there’s more to writing than just, you know, writing, I’ll be posting additional stuff from the week. Go check it out! The Two Questions With… Blog tour is happening again!! 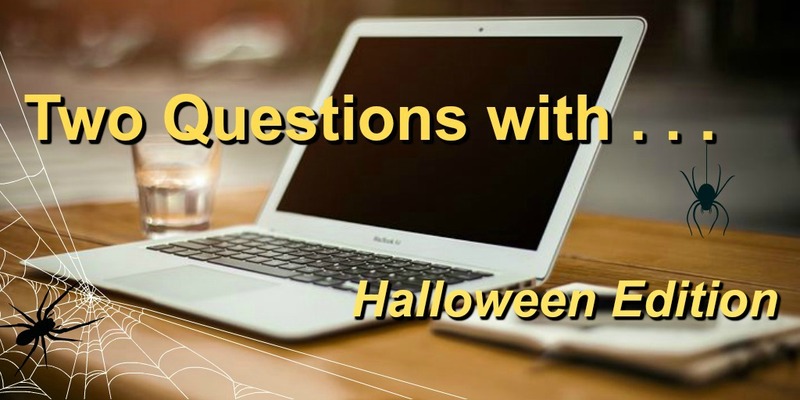 The Halloween Edition of “Two Questions with…” has risen fully from Beyond!! Come join us every Monday in October as we, a small coven of writers, emerge from the darkness to share our harrowing delights with you. Each week, we will tour each other’s blogs and answer questions about our favorite spooky shenanigans. Who are these Children of the Night, you ask? Be sure to stop by the Events Page for my schedule, and check out the other authors to see what they’re scaring up for you! !